← Should you retire dropped climbing gear? I was fortunate enough to be able to take a day off work back in May and wander down to the Red River Gorge in Slade, KY.
I’ve been there plenty of times before and sadly, living in Michigan, it’s the closet I get to ‘local’ rock at 6 hours away. (That’s any good anyways…) The crew that ended up going included yours truly, three newbie climbers, and two friends that see more plastic than rock. This, I did not know, and somehow I ended up being the veteran climber, even though I was by far not the strongest of the bunch. We also ended meeting up with a Mother/Daughter pair a for couple of climbs (how they manage as partners I’ll never know), and they’re level of experience wasn’t super clear either. Regardless a few things happened over the weekend that deserve a little attention. 1. Always check to make sure you’re on belay. Seems like a no brainer right? Well apparently its not, and mistakes happen. It’s one thing to be focused on the climb you’re about to do. It’s a whole other thing to start climbing without doing safety checks of any kind. 2. Know your gear, and whats attached where, and how. Lets just say it’s easier to drop things when your pieces are unfamiliar. So familiarize yourself! If you’re borrowing anything from a friend, play with it. Inspect it, and learn as much about it as you can before using it. Dropping a cam because of fat fingers in little carabiners is one thing, dropping your only rappel device could be a disaster. 3. Help outfit your friends. If you are venturing into the great outdoors with people that are new to spending time away from the city, please, please, do a verbal checklist with them. No one wants to get caught in a downpour without a rain jacket, or doing an approach in flip flops (or barefoot!) to make up for poor planning. 4. Stay calm and collected. Really. Everyone makes mistakes, and can get upset over failed climbs, but bringing everyone down because of one mishap is just un-cool. And not thinking clearly and failing to double check your safety system is the number one reason people get hurt. If you need a breather, take one. And support your friends who need it. This last one, I’ve had trouble with in the past. And never plan on having in the future. 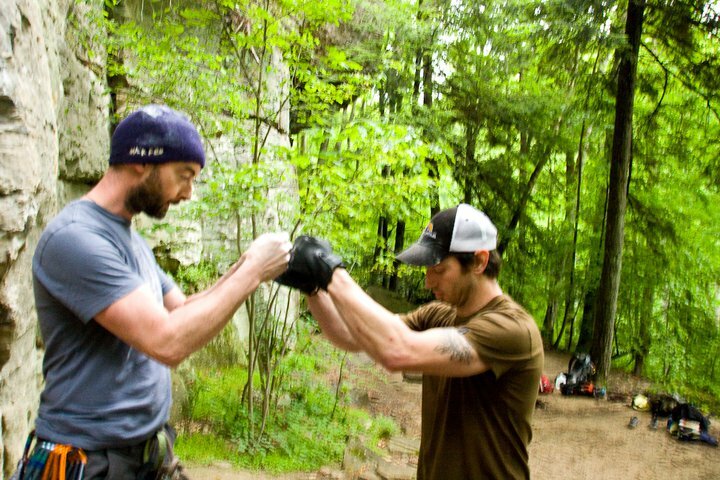 If you don’t trust your climbing parter, tell them. If something seems sketchy, tell someone. If you are not comfortable, talk it out. I missed doing an amazing climb once because I didn’t speak up, and was taken advantage of. Don’t let this happen to you. Of course, the last thing is have fun. The best way to ensure a good time is by being prepared. Evaluate your situation, and your friends experience levels. Be cool, speak your mind, and realize that climbing really is a team sport. Doing the 'pound' before every climb, after every safety check! This entry was posted in Miscellaneous, womens issues and tagged climbing, climbing mistakes, climbing safety, new climbers, red river gorge, red river rock climbing, rock climbing, rrg, safe climb. Bookmark the permalink.